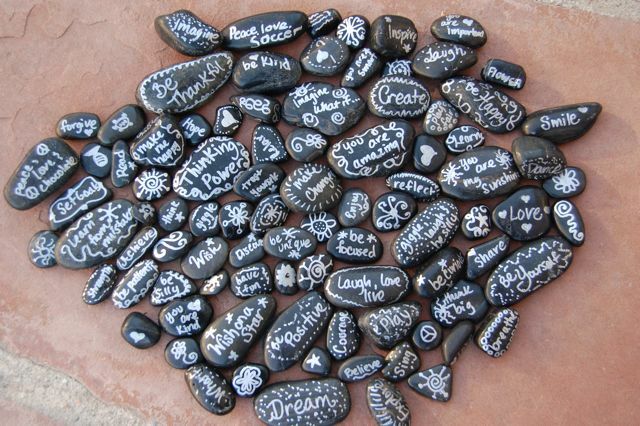 Inspirational stones have the ability to inspire, brighten your day and enact change. 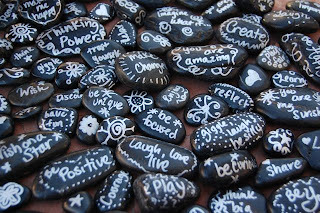 Think Stones combine positive messages with the therapeutic benefits of river rocks. 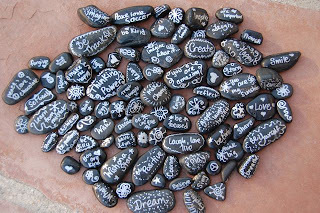 To make my own I made a list of all the positive sayings and inspirational words that make me smile, purchased some black river rocks, a silver sharpie and created my own Think Stones. When my children saw them, they could not stop touching, reading and playing with them. That evening at dinner we brainstormed more words and sayings they would like on the rocks. 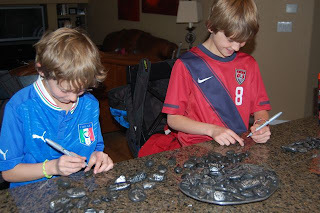 My children had a blast making their own stones some with sayings special to them and others just with drawings. The brainstorming and creative process allowed them to explore and show their passions, silliness and uniqueness. Providing such outlets is important for mental release while at the same time teaching the importance of having a positive outlook on like. Place your Think Stones in a bowl or on a tray on the coffee table. Place a Think Stone at each family member’s place setting for breakfast or dinner. Place them around the yard, garden or in planters. Place them around the house for family members to find randomly. Take them to work and share in a meeting room or in a bowl on your desk. Place a few in a pretty bag and give as a gift. Place one in your child’s lunchbox or backpack. They make great worry stones. River rocks can be purchased here at Amazon or at your local craft store. We hope you are inspired to make Think Stones for your family or classroom. Check out my Pinterest Boards for links to other Inspirational Stone ideas.